It is believed that the subspecies kept in American aviaies is the asiae which is native to western India. Habitat: Varied, prefers areas of thick vegetation, usually near water. Male: The face and breast are jet black in color. Distinctive white, almost oval markings are found on the outer edes of the breast below a chestnut band which encircles the neck like a collar. A large white cheek patch appears below and behind each eye. The crown, upper back, and wings are mottled brown, black and white. The lower back and tail are black barred with white and fulvous brown. The lower part of the abdomen near the legs is chestnut barred with white. The legs are reddish orange. Female: Generally sandy brown in color with black and white scalloped markings. The throat and abdomen are marked with black Y-shaped bars which vary in intensity and size. The chestnut color is found mainly on the back of the neck. 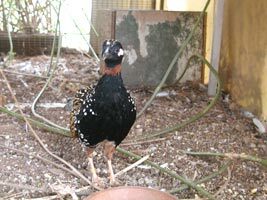 Status in Wild: As mentioned, the Black Francolin once had a broad range from Spain east to India, now has been eliminated from most of Europe and is threatened in Russia and in Cyprus. The status in Asia has not been well documented. 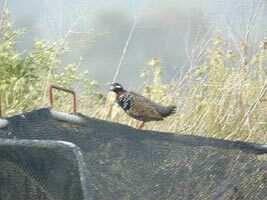 Where it has been introduced on Hawaii, it is now thriving and is a game species; the status in Louisana and Florida is not known at this time. Breeding Season: April to June. Incubation Period: 18 to 19 days. Males make loud calls during the breeding season and they may also become aggressive during this season.